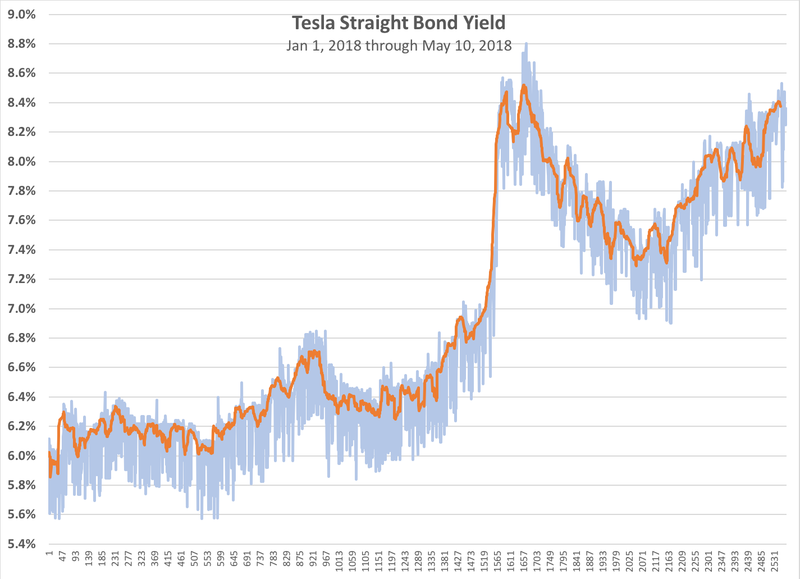 Tesla has one straight bond, an 8-year bond at 5.3% with a semiannual coupon payment, maturing Aug 15, 2025. I have been putting trade data into a spreadsheet for several months, with the underlying goal of comparing that bond with "B" rated bonds. Does the Tesla bond track other low-rated bonds? The quick answer is "yes." That has two caveats: first, the bond is thinly traded, and I benchmark against one bond fund that provides only a daily closing price. Second, the differential moves around, with one obvious discontinuity: yields jumped when Moody's downgraded Tesla. First, the graph below provides trade-by-trade yields and a trade-volume-weighted moving average (a lot of 1,000,000 counts more than one of 5,000). These data are only for sell-side prices, and don't differentiate between various markup strategies. There are days with a dozen or fewer trades, and only the occasional day with 30 or more. Crude, but I chose not to throw out observations or try to adjust for markups (I could see no pattern). I did look at buy-side data, but there are very few trades reported, so I kept them out of the mix. What do we see? Back in early April the yield jumped to 8.5%, and over the past month has gradually rise back to 8.4%. However, that's in the context of rising interest rates. So comes the second chart, to which I added additional days on a sampled basis (every 25th screen of prices...). 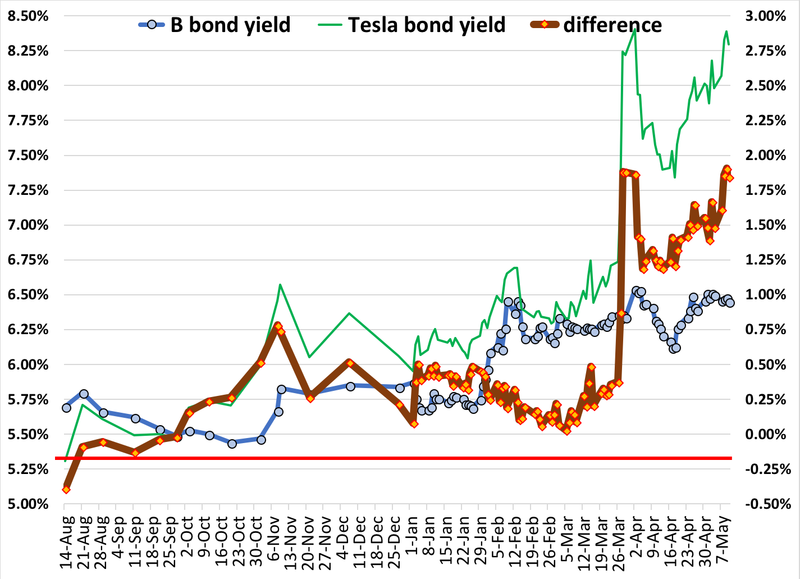 When Tesla first issued their bond, it traded at a 40bp premium to the ICE BofAML US High Yield B Effective Yield. That disappeared within a month, and thereafter (with noise) the Tesla bond traded at a 25bp premium to B-bonds. Then came the Moody's downgrade, and yields instantly jumped by 150bp relative to B-bonds. Yields then fell back for most of April, but are now back to the immediate post-downgrade level. My hunch is they'll stay at about where they unless (or if you're a bear, until) there's another downgrade. That's based on the assumption that those buying such bonds assemble a broad portfolio, particularly for ones with a low rating. In other words, bond traders trade the rating, not the company. Nothing in bond prices suggests that they read Tesla's financials closely. Yes, yields climbed almost 40bp after the earnings call – but in a noisy manner. Indeed, the most recent date (Thur 10 May 2018) shows yields dropping a bit. I will revisit in a month or so, but for now what I see over the last month is noise, not trend. I could not get excel to label the axis sensibly for trade data, which provide the hour and minute and not just the day. So the axis is trade by trade, rather than by date. Trades are detailed by the Financial Industry Regulatory Agency at Tesla bond yield. On some days there are as few as 3 recorded buy-side transactions. I don't report those data, but the yield differential tracks that of the sell side. While logically buyers pay more than sellers, fees get buried in prices and I cannot in general match a "buy" with a "sell." When I can, the price is typically identical, that is, fees aren't built into the reported price. I had been intending to track data longer, but post now in response to Bill Maurer on Seeking Alpha.